For more than 35 years, Lev’s Paint & Body Shop Inc has been providing high quality collision repair services to the Richmond, Rosenberg, Pleak, Fairchild, Needville, Damon, Guy, Fulshear, Simonton, Wallis, Katy, Sugar Land, and surrounding areas. We are fully trained and use the latest technologies to get your car or truck looking brand new again. We go above and beyond to make sure you are satisfied with your repair work. Your vehicle is damaged and you suddenly need repair service. You may have to make a claim with your insurance company or with one of the hundreds of other companies that may be responsible for covering the costs of your repair. 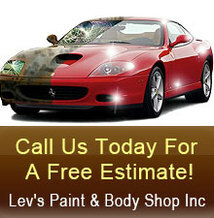 Call Lev's Paint & Body Shop first! We'll work for you to process the paperwork and get you scheduled for repairs sooner and with less hassle.